It turns out to be an extraordinary day for Tom and Elena when one morning their ordinary goose lays a golden egg. 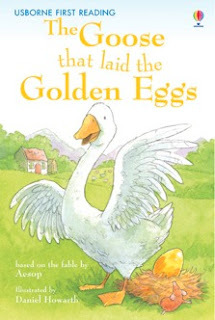 The goose lays another golden egg the next day, and another and another. Tom and Elena won't remain poor anymore. But what happens when one gold egg a day doesn't seem enough? This is one of Aesop's well-known fables with a simple lesson that a greedy person loses everything.